By Anping Shen, ED. D.
Jason was born in China and went through from pre-­‐school to graduate school in the United States. During his junior year at the Newton North High School, Newton, MA, Jason was selected as a member of the USA National Man’s Junior Gymnastics Team. In 2009, Jason was a co-­‐captain of Stanford Man’s Gymnastics team, which won both the NCAA man’s gymnastics national championship and academic championship titles (the first team in the history of man’s gymnastics to win both titles in the same year). Upon his graduation from Stanford in 2009, he served as Chief Operating Officer for the Stanford Daily newspaper company and then worked as a sales rep for a startup in Silicon Valley. He co-founded an online company (www.ridejoy.com) in San Francisco in May of 2011. He was back visiting his parents recently and talked to his father about his (real) company and passion for a healthy, competitive and purposeful life. 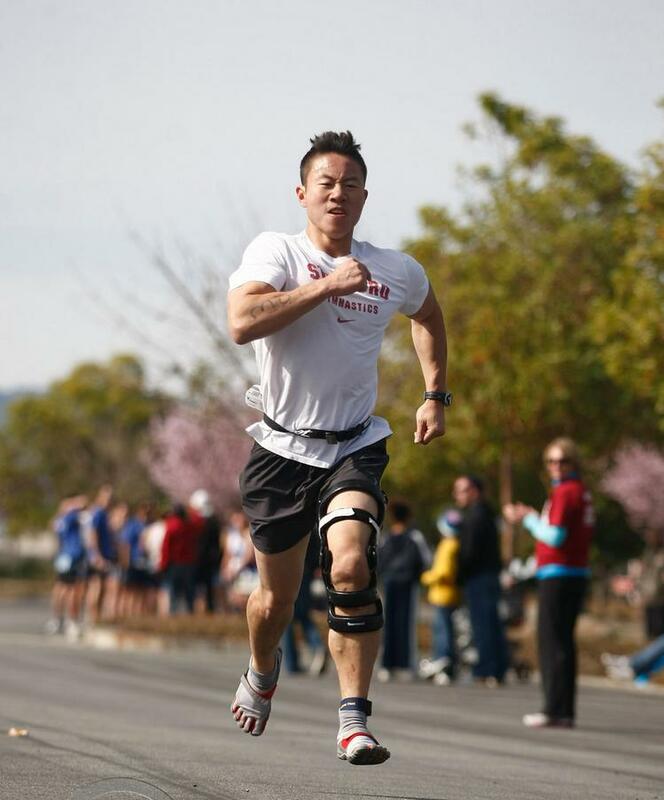 Jason Shen was competing in a recent triathlon event. Dad: Jason, the other day when we were talking about your life in San Francisco, I noted that “you were chasing your dream there,” you corrected me saying that “No, I am living my dream.” So would you say something more about your dream? Jason: Yes, I’m living my dream right now. I am already doing what I wanted to be doing. I am building a company that will have an impact on the world. I have been fortunate to graduate from Stanford, and to meet great people. I am now living in San Francisco. A lot of people come here and Silicon Valley, because this is where the new stuff is happening. This is the promised land of technology. We have an idea, we have a team, we have a company, and now we have the funding. Hundreds of people are using our website everyday to get rides, to go where they want to go. People email us every day, telling us how happy they are. They say they are so glad to find our website and they say it is so well organized and so easy to find out what they want. Ultimately our goal is to become a big company, a company that has a big impact. In the ideal case, we will be making a lot of money too. We have found some way of creating a company with a lot of value. So that’s why I say that we are living in the dream. This is it! Dad: You guys just started this company a few months ago, and now you are sounding like being so successful. Dad: (Laughing) Well, there might be some truth to it. To many Asian parents, at least to some Chinese parents I know of, they do like their children to have a respectable job, such as a well-­‐paid doctor, lawyer, investment banker, or professor and scientist with a regular income, after you got an advanced degree like MD, JD, MBA, or PhD. But your company is not even a real company yet, is that right? Jason: I don’t know what you mean by not a real company yet. You are doing it again. (Dad: laughing) You are making a negative statement, you are saying this is not a real company, and then you asked me to confirm it. It is a real company, this is a legit company since May (2011) when we formed the structure of the company, registered the name and filled all the documents. We issued shares in June, we have shareholders, we have a board of directors, and we have investors. This has been a real company since June. So I don’t know what you mean. Dad: Well, you guys are still living in your own apartment. You are using your own computers doing your work. Normally, we would think if this is a real company, you will have a company headquarter, some physical office space, with a formal CEO in charge of an organization and some staff. Jason: That is your assumption about what a real company is. We do have a physical building, which is our apartment. That is officially the headquarters of our company as written on our legal documents. Nowadays people can operate their entire business in the virtual world. They don’t necessarily need a location. They don’t need a headquarters, a big office with secretaries, front desk, and even an official phone number. All these things can be virtual. You can outsource your own phone number and get an 800-­‐phone number very easily. You can even get a system to help rent space in the large office building, so that you can do meetings and receive mails there. You can really do all those things without physically being there at all. There are lots of people who run their business from their laptops. You know, your definition of “respectable job” indicates your sense of status, the same with the definition of a real company, the same with your degrees and job titles. Respectable. Respectable to whom? I know there are many people reading my blog and have heard of my company, and they wish they could do what I am doing right now. To them, what I am doing is extremely respectable. They respect and admire what I am doing. It depends on whom you are talking about. If you are talking about other parents of your age, who moved from China to America and were established and conservative, sure, they may agree with you. But “respectable” is in the eye of a beholder, just like beauty. There is nothing I find particularly respectable about being a lawyer. You are a highly paid service person, not much different from being a plumber. Is a plumber a respectable job? At the core of it, lawyers and plumbers are the same. Somebody pays you to do something that you don’t want or you can’t do. Whether it is a lawyer or a plumber, it is a service profession. I could argue there isn’t something particularly respectable being a lawyer or doctor. Again, it is a matter of perspective. You should realize that there is no point of living your life to meet other people’s expectation. It’s not their life, it is my life. I have to live the life according the decisions I made, not somebody else made. If they don’t like it, it’s their problem. They can live their own life. If I don’t like my life, there is nothing anybody else can do about it. The only person who can do anything about my life, if I am not happy about it, is me. Dad: I have been working in my current position for 17 years, and your mom has been working even longer in her job. We both have pretty secure jobs. But there are many uncertainties in your work, when do you think you would settle down and probably think about your family and long term career goal. You know, our Chinese parents would often expect their children to go to a good university, get a good job and raise a family and move to next step. So what are your response to that kind of expectation? Jason: There are a couple of things here. One is that I don’t think there is such thing as job security any more. Past performance does not equal future outcomes. Just because that you had your job for the last fifteen years, or twenty years does not mean it will not disappear tomorrow. Tomorrow something could happen and the entire division could be cut. Or in gymnastics, someone could break his or her neck during a gymnastics competition on national television and no one would want to do gymnastics anymore. You know, those things can happen. The fact is the path I am pursuing is the most optimal path for me. Especially when you are young, you want to develop skills, relationships, expertise, and a network. Those are the things I am developing right now. I actually have more job security than most people right now. I know, at least for a year and half, I am going to get paid (based on the current company’s funding). And I am in control of that. Most people cannot say that. Secondly, you talk about settling down. What does “settle down” mean? I have no interest in settling down. To me, settling down means that you’re no longer growing. If you’re not growing, what’s the point? What does “settling down” mean to you? Does that mean you have one job and you will keep doing it for a long time? Dad: Yeah, especially if it is a good job and brings a good income, if every day you go to work and you know you have a job and you feel secured. Jason: Well, as I said that there is no job security anymore, because any job can disappear overnight. So if you think you have job security, then you are just being delusional, because you don’t understand the reality of the situation you find yourself in. Dad: Well, I’m working for the government, and we have union protection. So in that sense it is quite secure. And I know some of my friends, particularly those in the tech field, are kind of envious of my job security now. Jason: You are part of a different generation. Unions do not exist in most jobs nowadays. This is not the path that can be pursued by my generation. Dad: Assuming you are dating a girl, and she is interested in you. But she is saying that your job is not reliable and I cannot start a relationship with you. So what would you say to her? Jason: I am not interested in dating a girl who has that perspective. The world is not certain. You see that tornadoes, hurricanes, natural disasters happen, the acts of terrorism happen, economic recessions happen. Things happen all the time. I’m interested in being with somebody who can deal with that harsh reality, or the struggle that can befall on anybody at anytime. If somebody is looking for comfort and security, the only way they can find them is through delusion. I think the better path is to develop your own ability and your own resources, develop everything you have at your disposal in order to weather those difficult times. If my company goes under, people in my industry know that I’m good at what I am dong and are going to hire me. If I have skills that other people know about and are willing to pay me for them, then I will never have problems. My skills will be in demand, and somebody will need those skills for their work and I can deliver it. Dad: You went to Stanford, and you got your BA in Biology and a Master’s in Biology and Philosophy. Many people would say this could be excellent all-­‐around education one could have. So what do you think this experience mean to you now as an entrepreneur? Was it a good preparation for your current work? Jason: Obviously it was good. However, it is really hard to retrospectively say whether it was the best path. Perhaps because I am happy now, I should say that it was the right path. Yet if I took a different path, I have no idea how things would end up or how my life would be unfolding. Apparently biology does not directly correlate with my current work. We are not doing any work directly related to biology. However, biology does teach me how to think rigorously and empirically, how to think like a scientist. It taught me that things can be understood. You can perform tasks to understand the unknown phenomena and create a way of understanding something that seems mysterious and confusing. You learned that new things can be mastered. My Stanford education gives me more appreciation of science, engineering, and my life in a broader sense. Dad: Talking about your life, you have always been physically active ever since you were born. You were also an independent-­‐minded teenager in schools and in life. I know many of Asian parents would start talking about discipline to their kids when they are still young, like in elementary school. I think I started talking to you about discipline when you were in high school. Basically I said that you have academic and physical talent, sports achievement, and good personality, so if you have a good sense of discipline, you will go very far. I don’t think you were listening to me then. (Jason: laughing) Now you appear to be living a disciplined life, which is an amazing change. So what is your secret of disciplining yourself now? Jason: Discipline is getting yourself to do something you normally don’t want to do, or forcing yourself not to do something – like deciding not to eat a cookie when you are on a diet, even though you are really hungry. I don’t think I’m more disciplined now, but I do think I have oriented my life in such a way so that my natural tendencies are actually good for my long term goals. For example, I found a diet where I can eat a lot of meat and feel full, and once a week I can eat a lot of candy and junk food, so that I get the best of both worlds. On the other hand, I do think I have gained more appreciation of pushing yourself through to get what you want. I learned from gymnastics that you need to work hard to get what you want. If what you want is important to you, you will make the effort. When I was younger, I did not know how I was doing was related to my future success in life. Like doing a lot of math problems for instance, I just didn’t care. “What’s the point?” I would often ask. I couldn’t intuitively sense that. That’s why I hardly got straight As in schools. I did well on standardized tests because I could tell those were important, but it’s just harder to get worked up about a regular test in school. When I am working on this company, I know exactly what the point is. We need to do whatever it takes to make this business successful. I want to see (car) ride sharing become a mainstream activity. I have set up a social structure where I don’t want to let people down. I know my co-founders have a lot of trust in me. They trust me to do a good job. So I feel if I slack off, I am letting them down. Similarly, when I was doing gymnastics, I did not want to let my team down. You are letting everybody else down if you don’t do your best. So I set up my life in such a way that I will not let others down. I want to let them know I am working hard and I’m doing a good job. Dad: So you are not calling this change as a result of discipline, you are calling this as a systematic change? Jason: You create a system that drives yourself to be as productive as possible. That is being smart, when you set your life up in such a way that what you naturally want to do is also the right thing to do. Discipline says what you want and what is good are two separate things. What I set up is to make what I want and what’s good for me are close to the same thing. Dad: When you came back home in early May this year, just after you quitted the job but before you guys started your company, you appeared to be gaining weight. As a health-­‐ sensitive person, I was a bit concerned. I mentioned to you that you may need to pay attention to your weight. You simply did not want to hear it. (Both Jason and Dad laughing) But now, you came back to be in a full control of your physical life, in terms of going to gym regularly, talking about running and racing, following a strict diet and other healthy daily routines. How come this change is so dramatic and complete? I am really impressed. What was the real driving force behind all these life changes? This is something that many Asian parents would be anxious to know and love to pass to their kids. I keep a good diet because I want to be a better and fast runner. I want to run marathons and being lighter can help me do that. So it’s about setting the system up that I can run fast, and I want to improve. So doing this diet is for myself. I’m not doing it because my dad happens to think it is a good idea to lose weight, which will be the last reason I will do anything. (Dad: good laughing). I am doing it because I want to run faster, and I want to put less pressure on my knee. Being lighter will have less impact on my knees, so that I can run for a longer time in my life. Dad: Remember that in you high school you hated jogging. Now with your knee injuries and follow-­‐up surgeries, you want to run, you are now talking about triathlon and even marathon. Jason: Because I am no longer doing any gymnastics now. In gymnastics I knew I was physically dominant and had the ability to prove myself. When I was doing gymnastics, I did not like running and it didn’t matter to me. Gymnastics was what I did. When I was done with gymnastics two years ago, there was a void in my life. I went to the gym and did my physical exercises, but there was nothing really competitive about it. There was nothing I can really feel that I was making progress. It’s not very motivating. When I ran my first 5K race in this past spring, it was so much fun. It felt so good, even though I was not among the best. I was beating some people, I ran faster than some people. And that was very motivating to me. I don’t like losing and I like winning. So from that perspective, I want to run faster and run farther. And there was a little pride in my physical exercise. I like to continue to let people know that I am physically fit and competitive. Dad: So you want to do it because you want to feel good about yourself. Jason: You have to have an ego if you wanted to do it yourself. I was always being ambitious. Remember that drawing I made about Li Xiaoping (one of the most accomplished Chinese top ranking gymnasts in the 1990s) and all the gold metals I was going to win some day? Dad: Now we are talking about the high level of personal development and enhancement. I am curious of the driving force behind your actions, and any values you’ve embraced in your life. Jason: I am always a value-­‐driven person ever since I read Stephen Covey’s “7 Habits of Highly Effective People” in my middle school. I realized that if you think about your life and what you are trying to do, you deliberate the actions you do, especially those things that matter to you. If you read the “Seven Habits”, the second habit talks about you begin with an end in your mind. You should think about what you want your friends to say about you at your funeral and what you want people to say about your life in their eulogy. Those are the things you need to live in your life in order to get there. What’s your goal? Those things need to be put into the perspective of your life. Even when I was reading that book as a child, I was thinking about what I wanted the people to say. And, of course, things evolve in time. I think you are shaped by whom you have been friends with. I think at the end of day, especially for guys, I don’t know about girls, we live to earn respect from our peers. We live to earn respect from the people we admire, those we look up to. We want to live up to be like them. When you go to Stanford, and when you live in Silicon Valley, when you see all these people who have created values out of nothing to an entire empire, you are just inspired to do something. Facebook was nothing 5 or 6 years ago. 10 or 12 years ago, Google was nothing. Think about everything Google has created for this world. All this would not have existed, if these people had not got together and done something. When we are in California, when we were at Stanford, we saw those things. They are so real to you. So part of what I’m doing is to earn respect from my peers. So creating a company and doing what I am doing will earn respect from those people I admire. Dad: So you have a strong interest in startup for the past few years, now this interest has turned into a passion. So what’s the driving force behind this passion, where will this passion lead you? Jason: I have a small company and I am going to make it a big company. When I say it is big, I did not mean it is big with lots of people, it is big with impact. We are making a small impact on world now. We will make a big impact on the world later. Paul Graham, who founded Y-­‐Combinator (a California based venture firm that has funded many startups including Jason’s company) has an article talking about the ambition of cities. He talks about how every city has different ambition. So when you are in New York, the ambition is money and the more the better. Money drives that city. In DC, it is more of status and who you know, which powerful person’s ear do you have. In Los Angeles, it’s whom you know. But this time it’s which celebrities you know and whom you hang out with. In Silicon Valley, the ambition is technical power. In the article, Graham explains that why people respect Google co-­‐founders Sergey Brin and Larry Page. It isn’t that they are billionaires, though they do have a lot of money and that’s fine. The reason that people respect and admire them is because they have power. They are in charge of the one of the most important technology companies in the world. Google affects practically everyone in the world. So you can say I have adopted some of those values in Silicon Valley. What excites me is not to make a lot of money, though money may be the direct outcome of my primary goals. My primary goals are to do something which has a lot of impact, to change the way people get around, to change the way people think about transportation. I asked people what interested them in their ride share experience. Somebody just sent me an email today. He says that we are facing a global challenge now and we need to do it together as a community. He says that ride share has reaffirmed the trust we have in each other. In many people it is why ride share is important. And I feel the same way. Ride share is helping one another get where we want to go and learn each other’s stories. Recently I spent six hours in a car with some people I had never known before during a ride from San Francisco to Eugene (Oregon) and I learned a lot from other passengers, about cooking, poetry, New Orleans and many other random topics. It was a wonderful experience. Cynically, you can say it’s just business, putting people together. It’s online, and it’s no big deal. They just want to get somewhere, they don’t want to buy a bus ticket, or they just want to make some gas money (by offering ride to others). But if I am feeling generous, I would say that ride share is changing the world. It opens people’s heart and mind to meet new people and talk to them. You have to take a leap of faith and to know they will come to your house and pick you up and keep you safe. Every time you go through that and feel it is ok, your trust and faith in humanity are reaffirmed. Anping Shen, Ed.D., was trained as a teacher and worked as a college faculty member for six years in China before attending Boston University for his graduate studies in education in the late 1990s. He is an education specialist for the Massachusetts Department of Education. 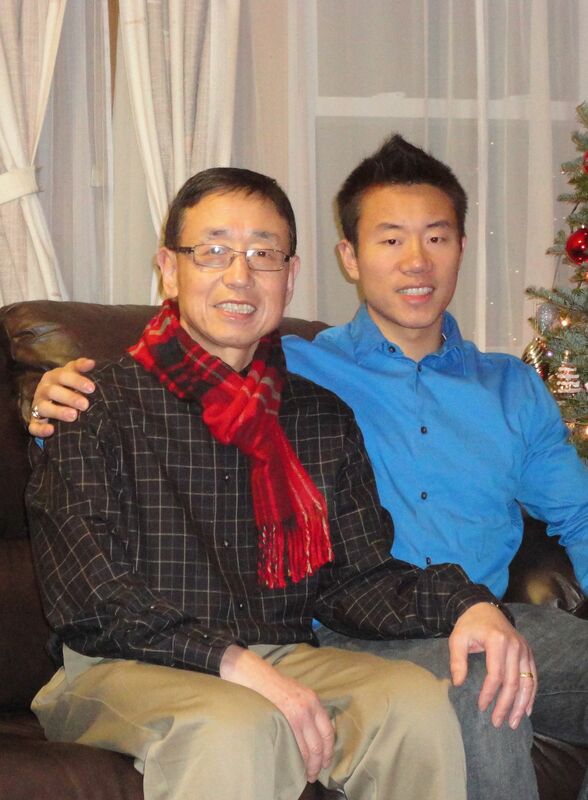 He was the principal and founding board chair of the Newton Chinese Language School, Newton, MA. He has been an active parenting educator in the greater Boston area and currently teaches a parenting/family education class at the Newton Chinese Language School every Sunday afternoon. Anping Shen has written many Chinese and English articles on education, cross-culture child development and parenting during past years. He can be reached at ashenedu@gmail.com. Jason’s company is scheduled to move into an office building in February 2012.